This may be rich and creamy and oh-so-bad for your hips but it’s downright delicious – especially on a cold winter’s day! Pre-heat oven to 150 °C / 300 °F / Gas Mark 2. Peel and finely slice potatoes. Blanche in boiling water for five minutes, then remove and place on a tray lined with a tea-towel. Wash and slice leeks into 1-2cm thick slices. Blanche and leave to drain. Grease two oven-proof dishes measuring approximately 11″ square each. 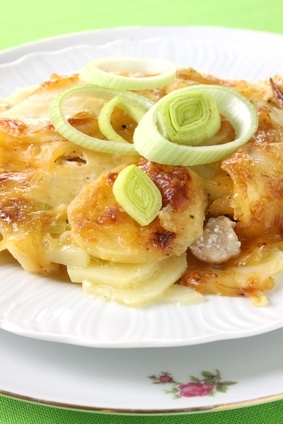 Place a layer of potatoes on the bottom of each dish, slightly overlapping them as you go and avoiding large gaps. Place a layer of leeks over the potatoes. Add one more layer of potatoes over the leeks, covering them completely. Pour cream evenly all over the dishes – one pot to each dish. Sprinkle grated cheese over the top. You may find it a little too rich to add this as well as the cream, so I’ve listed it as optional. Cover with foil. Bake in oven for two hours. Serve with green vegetables and/or cauliflower.